She waited at the 43 Masonic stop. 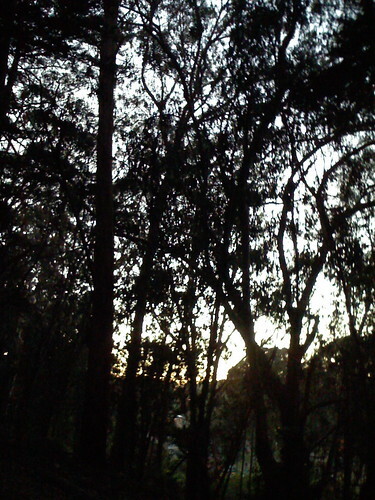 It was getting dark in the Presidio, and she kept thinking of that hit and run cyclist a few years ago. Hit on her bike, by a car, and nobody ID’d the car or came forward. How hard would it be to get hit on the back of the head, dragged into these blackberry bushes, raped, or something. She held her keys in between her fingers, a special fist of metal her roommate had showed her. She should have bought Mace. She checked her phone again- she’d waited at work until NextBus said there’d be a bus, but there was no bus IRL, and now Next Bus was telling her 20 minutes until the next one. Phantom buses! She debated on walking to the Lombard Gate. The mist was creeping into her layers and she was getting cold, dreaming of curling up on the couch with some mac & cheese and 3 saved episodes of Project Runway. Written Monday, August 18th, 2008 in hom.i.c.id.e. You can leave a response, or trackback from your own site.